Erstwhile Jeopardy! sensation and self-proclaimed pancake expert Ken Jennings had a hot tip for Twitter over the weekend: reheat pancakes in the toaster, not the microwave. Jennings’ clappy-hand smugness aside, the idea intrigues us. Waffles, pizza, and other starchy items generally wither in the microwave and turn into floppy sadness sponges, so toaster ovens or cast-iron pans are generally preferable. But pancakes in the toaster, eh? Alright, Jennings, you sly fox, we’re open to giving it a try. 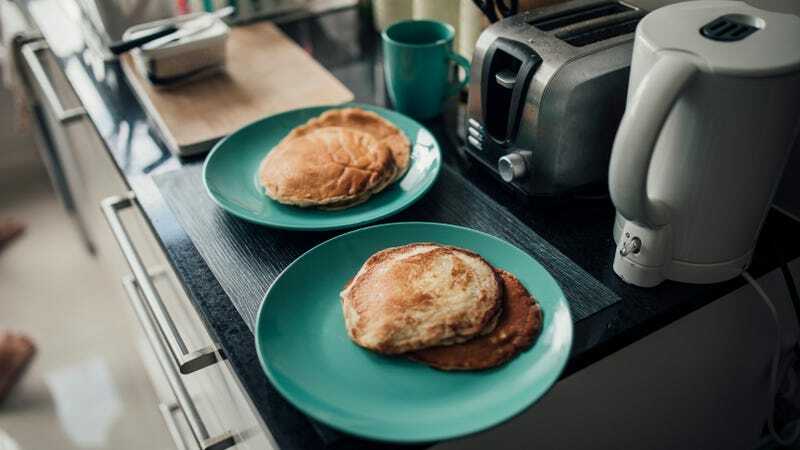 Twitter users brought up a number of salient points related to the pancake-reheating discussion, including the foundational question as to whether it’s not just marginally more work to make new pancakes. Also, a Twitter user from Ireland chimed in to add that prepackaged, toaster-ready pancakes are considered the gold standard over there. We have to admit that no Takeout staffer has ever reheated pancakes in the toaster. Readers, if you’ve done this, help us out with your pancake tips. Have we been living in the Dark Ages?